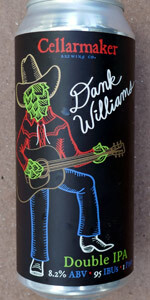 Dank Williams | Cellarmaker Brewing Co.
L: Pours straw yellow in color. Unfiltered in appearance but not quite NEIPA hazy. Not much of a head but leaves traces of lacing on the glass. Visually its a good looking beer. S: Dank AF. The dank/earthy aromas are the first thing that I smell when I opened the beer. Other than the dank resin, notes of grapefruit and lemon are also present. T: Dank initially, and dank on the finish. Lemon and grass initially, with mango, apricot and resinous dankness that lingers in the aftertaste. Fantastic. F: Medium in body and weight. Carbonation is moderate. O: This is a delicious beer. I don't taste the 8.2 abv, and I am enjoying it. It's a refreshing to try something like this after having so many "hazy's." I would drink again and am glad to have tried. Cheers! Lacks hop pungency and depth of flavour. Three-day old growler into a tulip glass. SO MUCH dank greatness on the nose! Scary easy drinking for the ABV. I'll be after this one again, love it for my palate and preferences! Appearance: Arrives at the bar with a hazy golden tinged amber color; the head was impressive as was the lacing. Dank Williams from Cellarmaker Brewing Co.